Earlier this year, Campus Compact—a group that brings together 1,100 colleges and universities to advance civic responsibility—held its 30th annual conference where it called on member campuses to develop Civic Action plans to embrace a set of five community commitments. 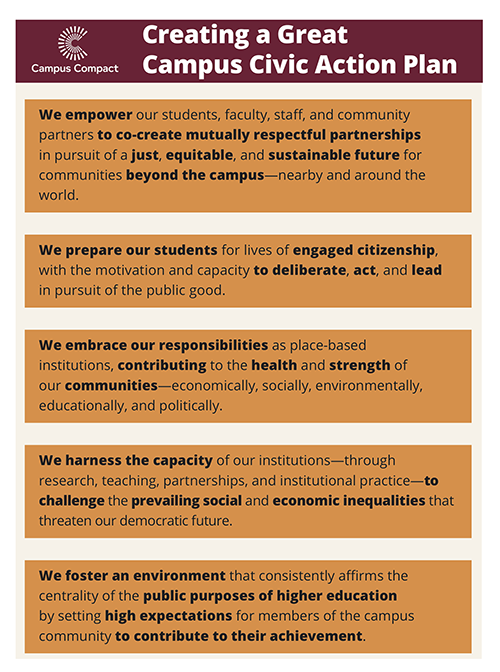 Those include co-creating mutually respectful partnerships with community groups, preparing students for lives of engaged citizenship, contributing to the health and strength of surrounding communities, challenging inequality, and affirming the public purpose of higher education. So far, over 400 member institutions have signed on. Three regional gatherings, each expected to attract 100 university participants or more, are scheduled this fall and are designed to spur action plan development on these community commitments. Additionally, Campus Compact has created a set of knowledge hub websites to provide further resources, including one on anchor mission strategies that I developed and one on assessing engagement developed by the directors of Campus Compact’s Missouri and Indiana chapters. For those working to build community wealth, the commitment language is highly encouraging. Of course, we used the word “half” in the title of our book for a reason—there is still a long way to go to build trust between institutions and communities. In an earlier post, I cited Andrew Frishkoff of LISC Philadelphia, who wrote, “Too often we have seen beneficent anchor institutions acting paternalistically on behalf of communities, instead of in partnership with them.” And certainly, as this Next City article notes, communities need to make their voice heard. It is clear though that university interest in community economic development is growing, providing possible points of entry for community development corporations, community development financial institutions, and others. Campus Compact is one prominent university initiative, but it is hardly the only one. For example, the American Democracy Project of the American Association of State Colleges and Universities, which represents four-year public institutions, and its community college partner The Democracy Commitment, have developed a joint Economic Inequality initiative to “help students think about and take action to confront the complex causes of growing economic inequality.” Launched in 2014, there are currently 21 four-year colleges participating. The Association of Public and Land-Grant Universities, representing over 200 schools, launched a task force last fall called the Task Force for the New Engagement. The group’s initial report calls for greater alignment of “community and university needs and assets” and for “recognizing that everything our institutions do needs to be aimed at society as a beneficiary.” The report calls for identifying 10 sites to pilot this approach in fall 2017. Another actor in this environment is the Anchor Institution Task Force. Founded in 2009, the Task Force now has 600 members from universities, hospitals, community foundations, libraries, arts institutions, and others invested in community economic development. The group will meet in New York City in November to discuss the state of the field in both economic development and community partnerships. At The Democracy Collaborative, our work with the Anchor Dashboard Learning Cohort (supported by the Annie E. Casey Foundation) has also deepened. The cohort of six universities is piloting an accountability framework. Participants track both institutional (mainly economic) variables—such as minority firm procurement and business development, community investment, and local hiring—as well as partnerships with community groups to meet K-12 education, public health, and nonprofit capacity- building needs. In their anchor mission work, some cohort participants have partnered directly with community groups through Promise Zone or Promise Neighborhood initiatives. For example, this has been a key part of the approach of Philadelphia-based Drexel University. Likewise, Rutgers University-Newark has partnered with community groups in the Fairmount Promise Neighborhood, while Buffalo State engages in similar work in Buffalo’s West Side Promise Neighborhood. Great read highlighting multiple layers of the complex issues Campus Compact and other organizations are working hard to bring attention to.